Lt Colonel Van Rensburg is called to the stand. He is the former Boschkop Police Station Commander. He resigned in December of last year after 29 years of service. He arrived at the scene at 3:55am on February 14, 2013. An ambulance was already there with it’s rear doors open. 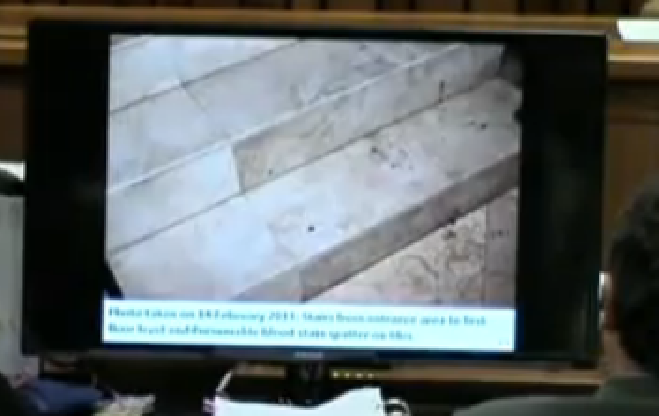 Lying on the floor near the stairs was the body of Reeva covered in towels and plastic bags. The paramedic had informed him that the person was dead upon their arrival (According to Dr. Stipp who was there prior to the paramedic, she was already dead when he got there too.) He and the paramedic removed the towels and the paramedic pointed out the injuries. Oscar was found in the kitchen, very emotional. Van Rensburg asked him what happened. Oscar did not respond. He then requested fingerprint, forensic and photographer personnel to come to the scene. Ms. Stander (the daughter of Mr. Johan Stander) was there talking to Oscar and consoling him. Ms. Stander told Van Rensburg that Oscar asked her father to use his car to take the deceased to the hospital, but he refused. Mr. Stander suggested that an ambulance be called. Ms. Stander told Van Rensburg that she and Oscar retrieved towels and black plastic bags to try to stop the bleeding. 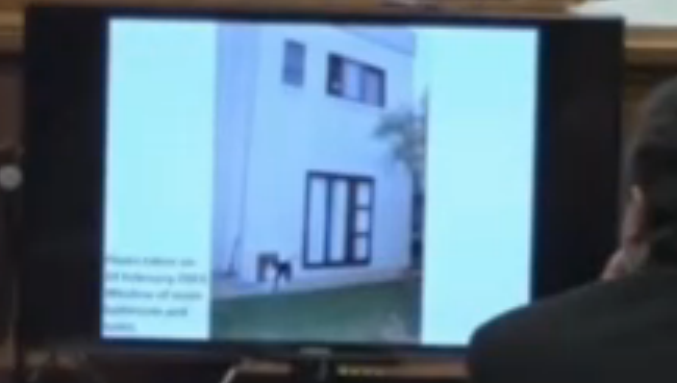 Ms. Stander also told Van Rensburg that when she arrived, Oscar had told her that he believed Reeva was an intruder. At this time, Oscar was pacing back and forth. 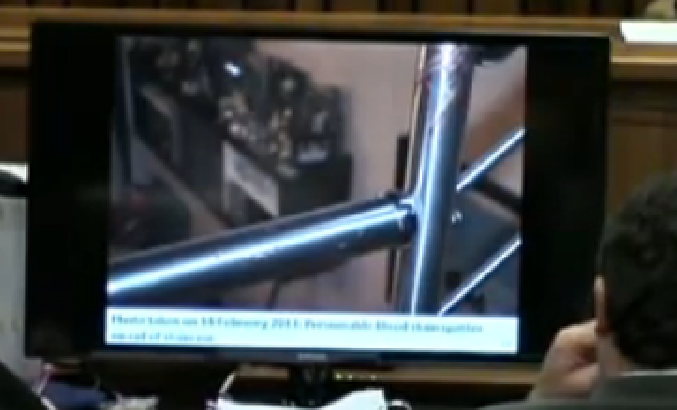 Van Rensburg ordered someone to control any access to the scene. Hilton Botha, another police officer, arrived and he showed him the body. They both went upstairs together and followed the blood trail. 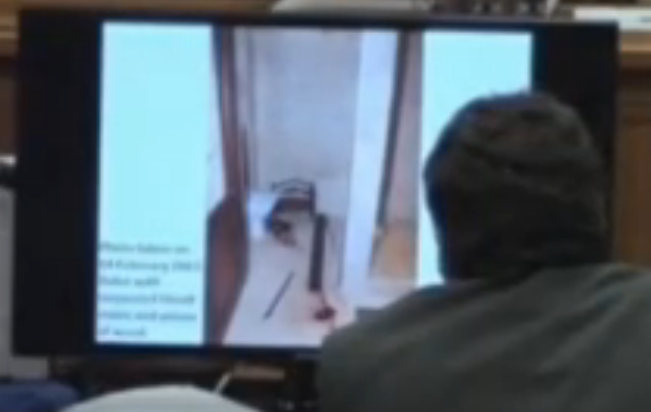 The following are the crime scene photos that were shown to the court. 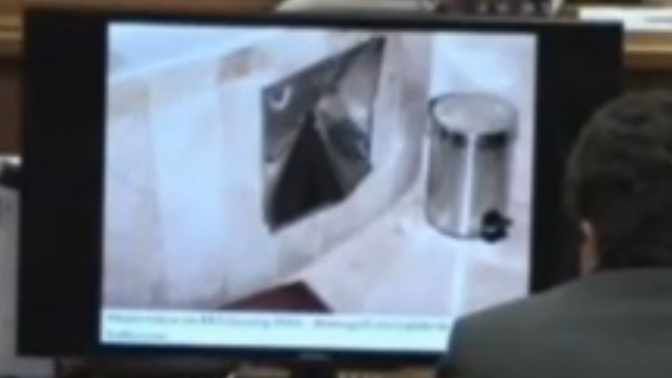 These photos are not released to the public, so the only way we can see them is on the video monitors at court. The quality is poor, and you will not be able to see a lot of the smaller blood spatter but you will get the jist of the layout and the scene as it was found. This is the front of Oscar’s house. 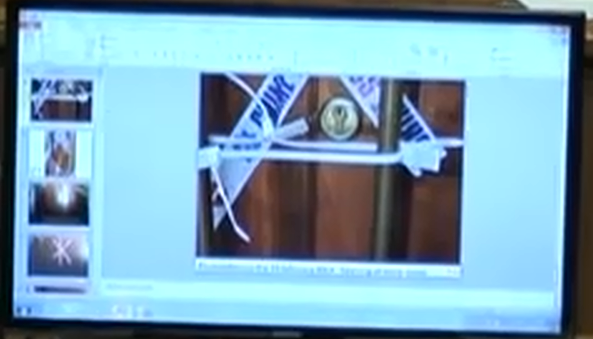 The main door is seen in the middle with police tape and the garage doors are off to the right. This is the view that you see as you enter through the front door in to the foyer. If you were to walk down those stairs and keep walking straight, you would be in the kitchen, so the kitchen is off to the left (not seen on this photo). This picture was taken inside the foyer. From this vantage point, the front door is off to the right and directly in front is the door that leads to the garage. 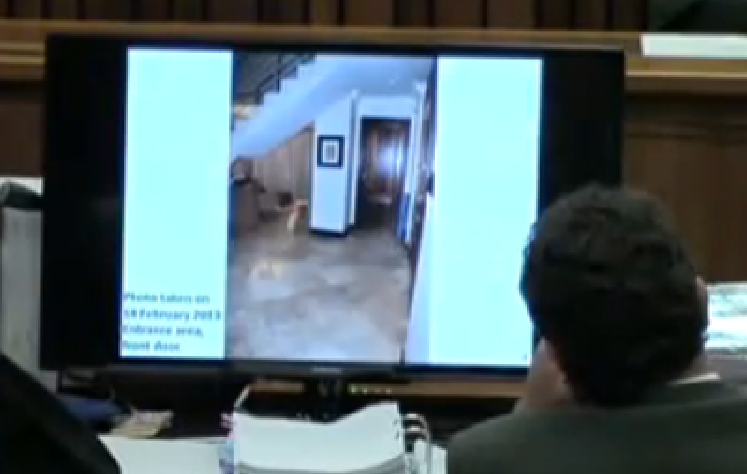 Inside the main foyer, standing near where the body was found at the bottom of the stairs. 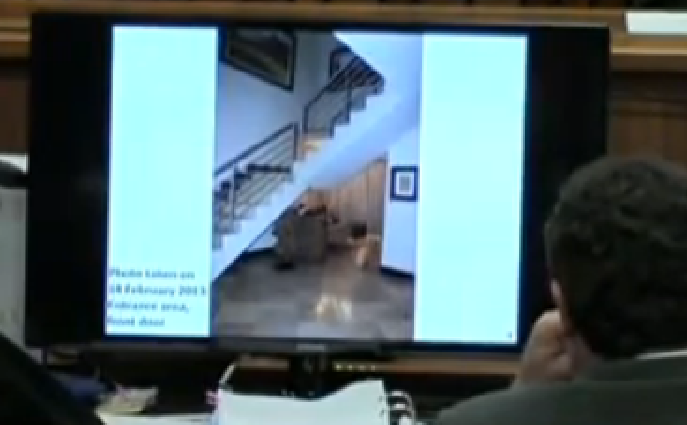 Looking straight ahead, you can see a small lounge area that is below/behind the staircase. Closer view of small lounge area. 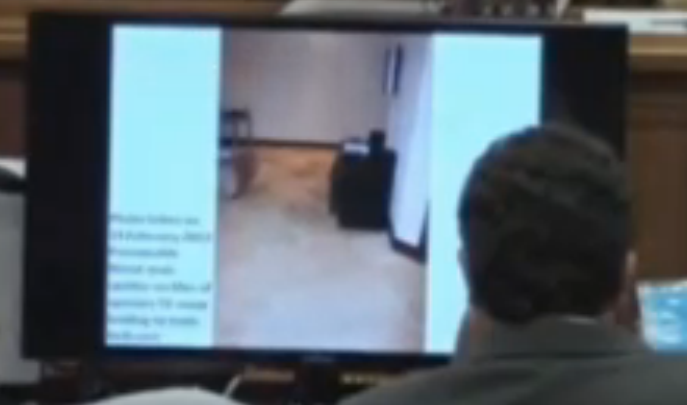 Blood spatter was found on the arm of the chair on the right side of the room. 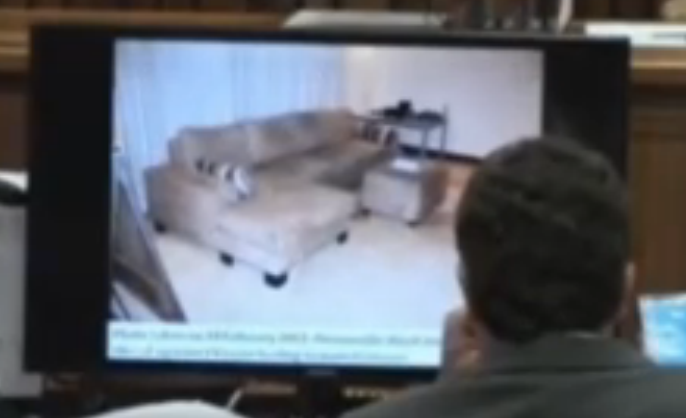 And spatter was also found on the chair on the left side of the room. 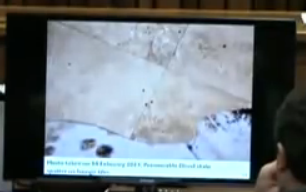 Blood spatter on floor near the rug in the lounge area. Looking up the stairs from the bottom. Blood spatter on the stairs. 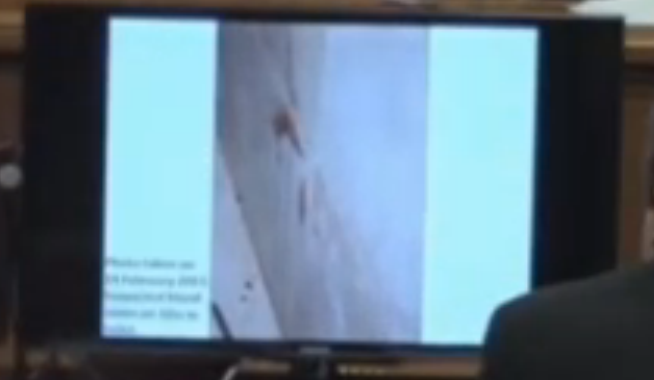 Blood spatter was found along the walls at various points of the staircase. 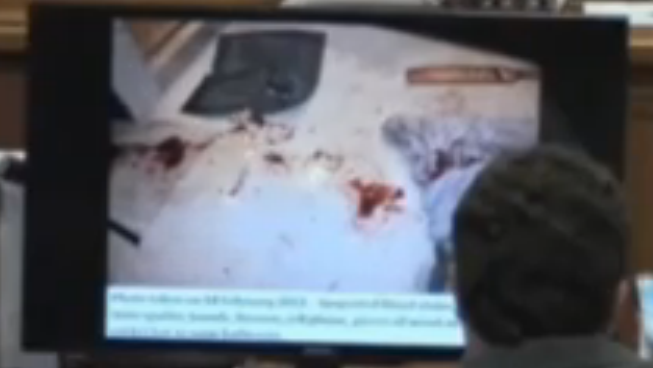 I was not able to screen grab any photos where you can clearly see the blood. But there were quite a few spatters. At the top of the stairs, looking to the left. 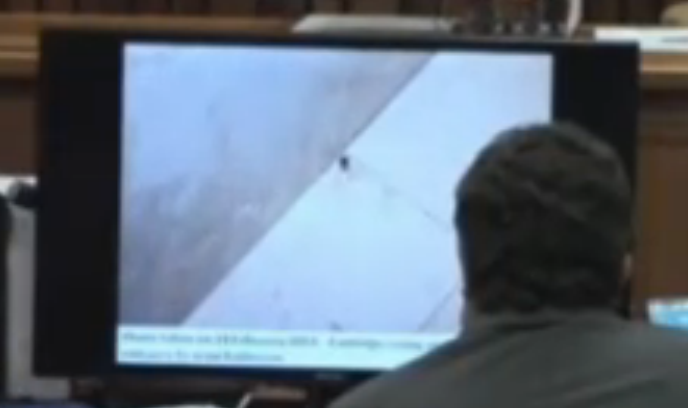 Blood spatter was found on that left wall. The door that is just beyond that wall leads to a roof area above the garage where there is a Jacuzzi. The door was locked, but Van Rensburg was able to open it with a key. 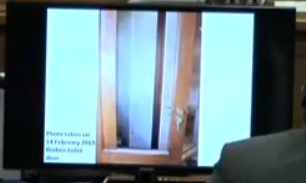 He inspected that area and there was no blood so he closed the door and locked it. At the top of the stairs looking down. At the top of the stairs, looking to the right. Upstairs hallway around the bend of the railing. The wooden cabinets on the left are the linen cabinets. 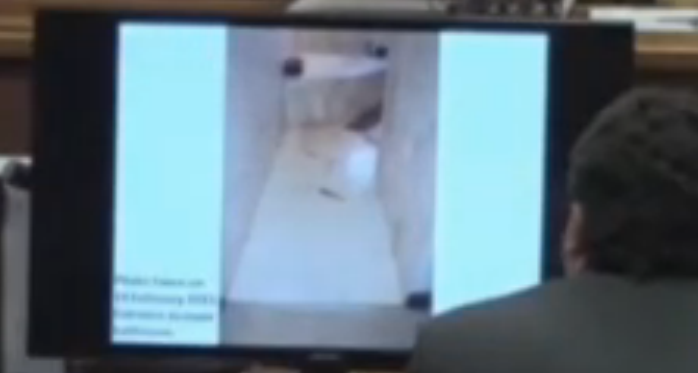 A blue towel can be seen on the floor just below. 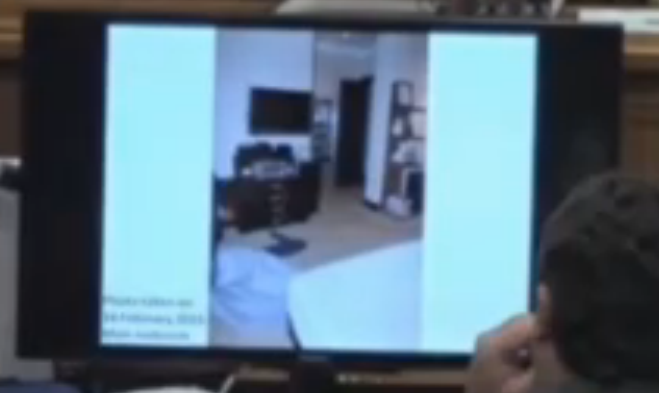 The door with the white circle on it leads to a spare bedroom. The wall that is on the right hand side, just past the end of the silver railing, also had blood spatter on it. Small lounge area upstairs outside of Oscar’s bedroom. Sofa in small lounge area. From inside the lounge area, looking out into the hallway. Looking down the hallway toward Oscar’s bedroom (lounge area would be off to the right). Blood spatter on the hallway wall leading to bedroom. Blood spatter on the hallway floor near bedroom entrance. The entrance to Oscar’s bedroom – note the air gun located on the right hand side leaning against the wall. Damage to bedroom door – see yellow circle. 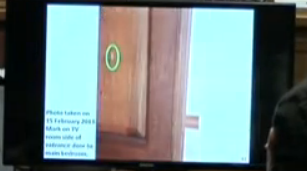 Van Rensburg testified that there was a hole through the door. Hole in the bedroom door. Hole in the bedroom door from the other side. Damage found on the bottom edge of the bedroom door. 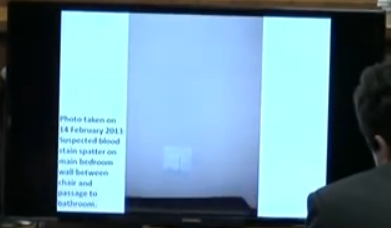 Damage was also found on the side of the bedroom door above the door handle. Another view of the damage to the bedroom door. NOTE: This is the first we are hearing of any damage to the bedroom door. The focus has always been on the bathroom but now we find out there was damage in other areas of the bedroom as well, which is huge! The State has not yet addressed the cause of this damage during trial. I will be very anxious to hear their conclusions. 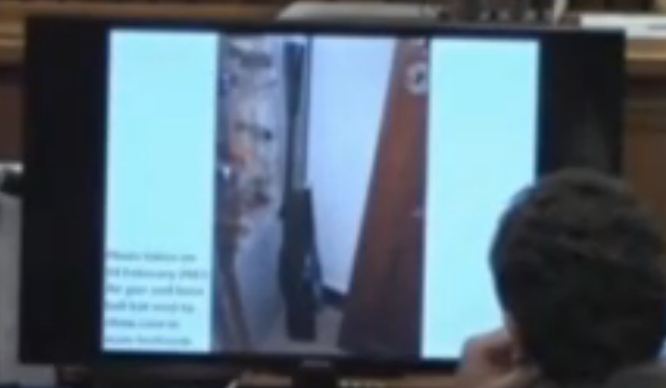 Air gun and blue baseball bat found leaning against wall near bedroom entrance. First view inside the bedroom – view of the right side of the bed and the balcony doors. 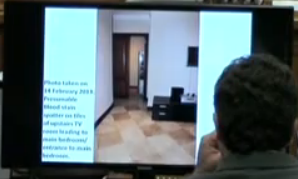 This is exactly how police found the room. The right side of the bed and floor. 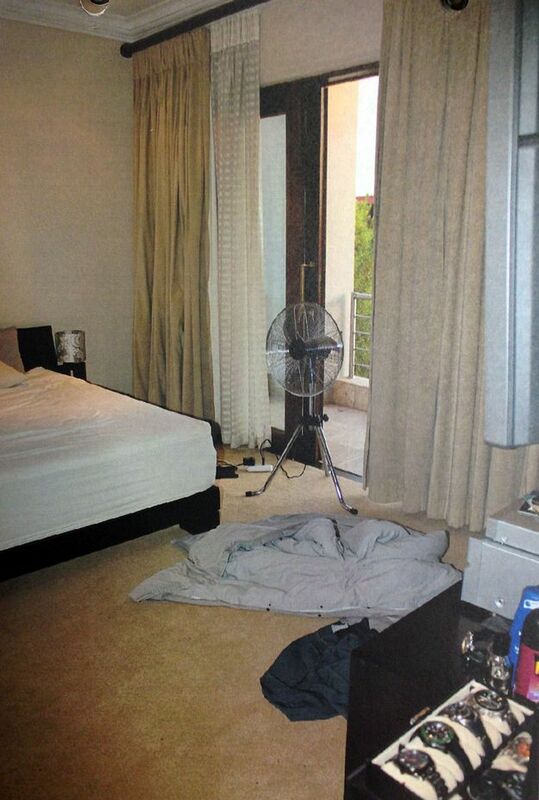 You can also see the fan that Oscar states he had retrieved off the balcony, according to the bail application. The duvet and a pair of blue jeans were found on the floor. A dresser with a stereo system on top. 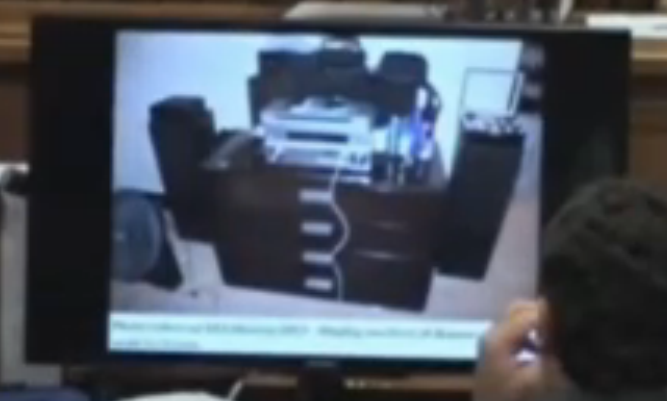 Two Blackberry phones were found on top of the stereo system. A watch case can be seen on top of the right side speaker. 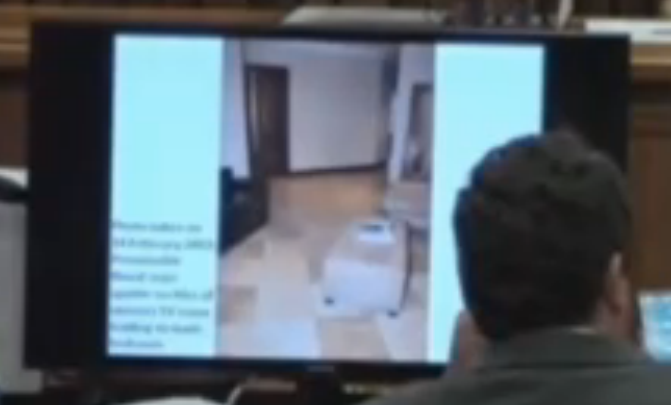 Another smaller fan can be seen on the floor to the left, unplugged. The case holding the watches. 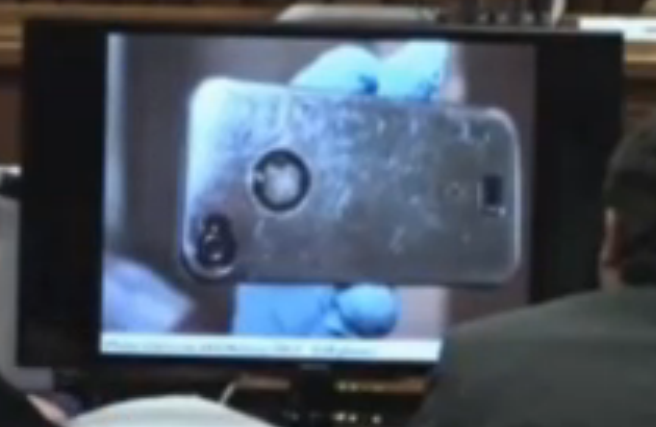 Blood spatter can be seen on the top of the case. The left side of the bed. 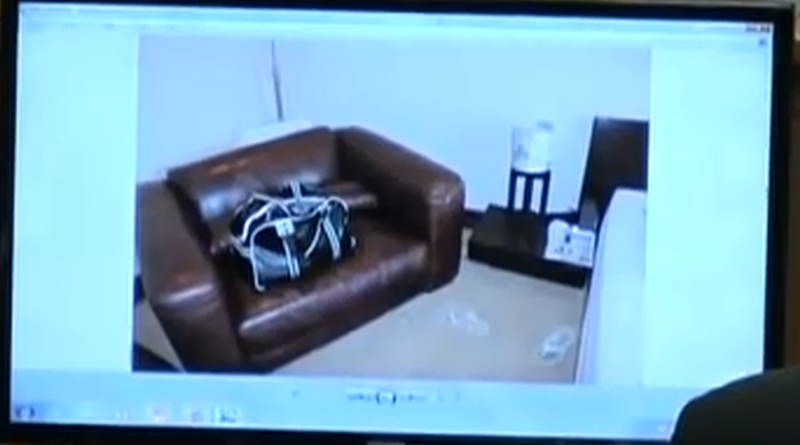 On top of the brown sofa is Reeva’s overnight bag. 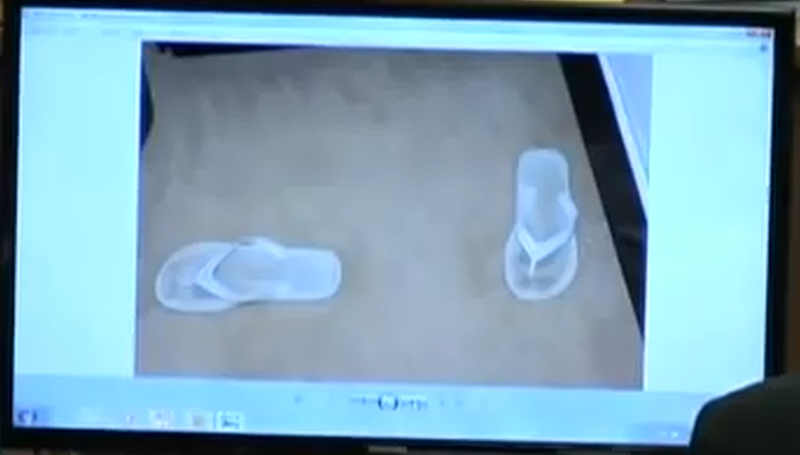 Her sandals/slippers can also be seen on the floor between the sofa and the bed. 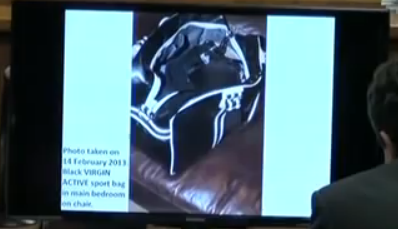 Reeva’s overnight bag, packed neatly. Switch to the thermometer (AC) in the bedroom. It was in the “off” position. There was a spatter of blood near this switch. 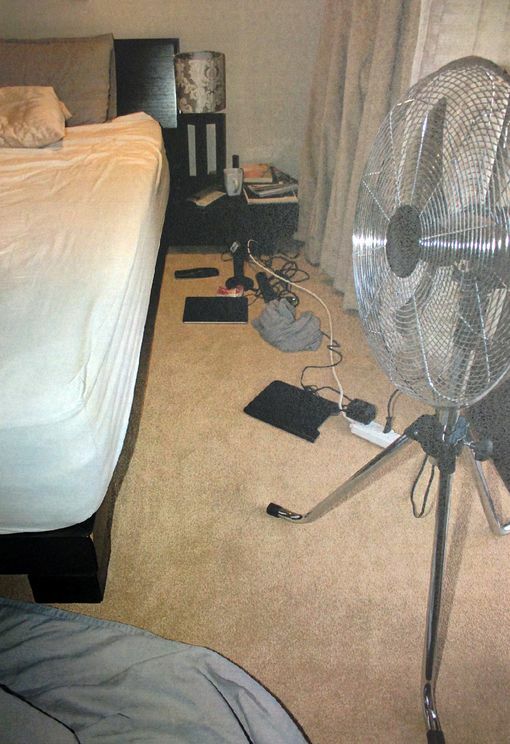 Lamp next to the left side of the bed – the gun holster was found in between the lamp and the edge of the bed. 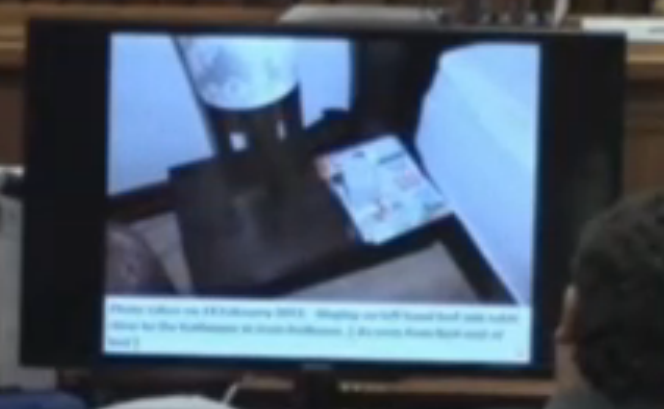 Also seen are a coffee cup on top of a few magazines. Close up of the holster. Standing near the balcony door, this is the view of the room – the bedroom door is on the left and the entrance to the bathroom hallway is on the right. The entrance to the hallway leading to the bathroom. The hallway to the bathroom. Bullet cartridge found in hallway to the bathroom. 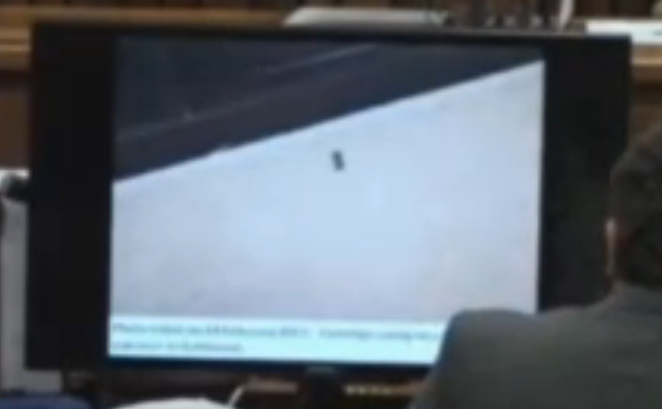 Close up of the cartridge found in hallway to the bathroom. The tiled entrance to the bathroom. The bath tub can be seen at the top of the photo. 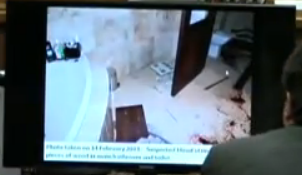 There was blood spatter found on the floor and wall, another cartridge found on the left side of the entrance and wood splinters from the toilet room door. 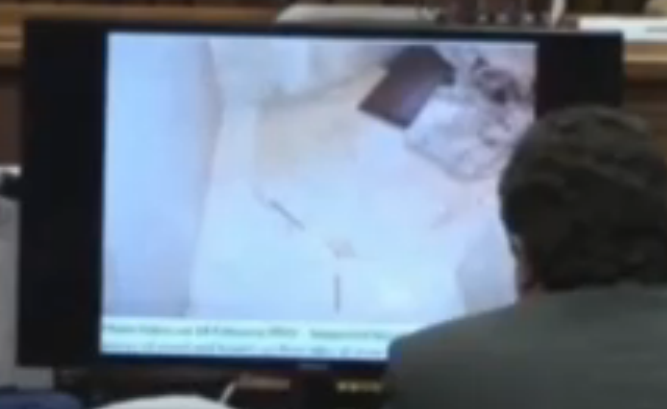 Close up of the cartridge found in the tiled entrance to the bathroom, near left wall. Blood spatter in entrance to the bathroom. Wood splinters and blood spatter in entrance to the bathroom. 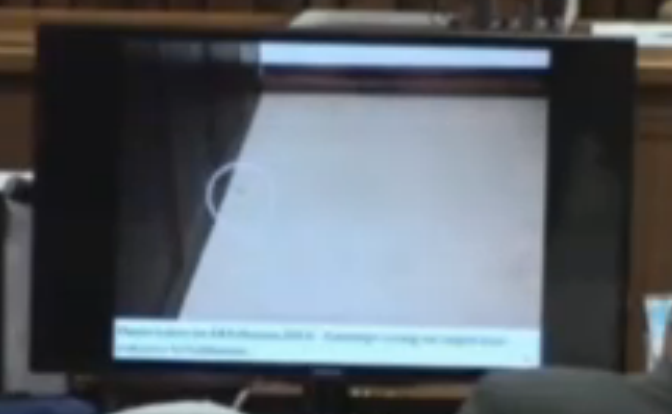 The white circle depicts where a third cartridge was found. And a close up of that cartridge. 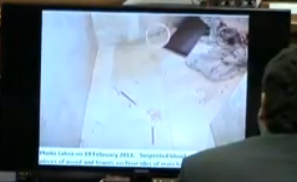 The three cones identify the location of the three bullet cartridges found in the bathroom. 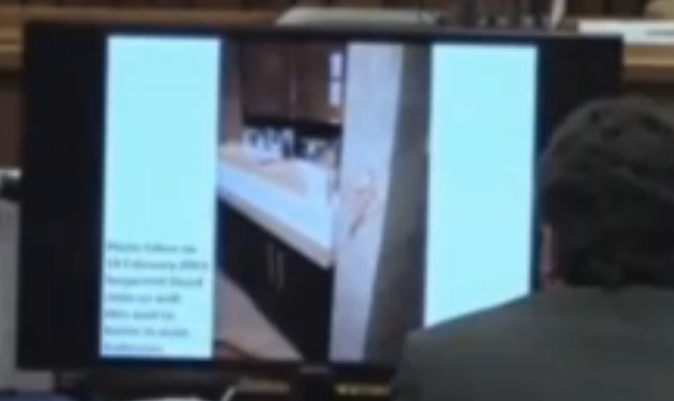 Bloody towels and wood panel found near bath tub. Another view of the sinks which are on the right hand side of the bathroom. 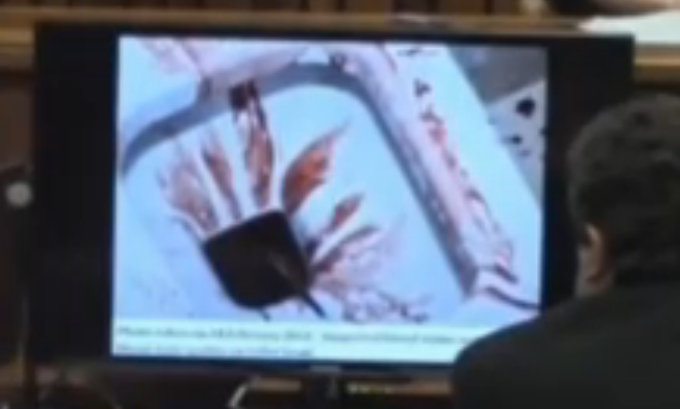 Blood spatter was found on the edge of the white counter. The floor of the bathroom – bloody towels, blood spatter, wood splinters from the door, a bloody cricket bat, the gun on top of the shower mat and a cell phone peeking out from underneath the shower mat can all be seen. Bloody towels and the bloody cricket bat used to break down the toilet room door. Bloody cricket bat and blood spatter. The fourth cartridge is seen on the right in this photo. 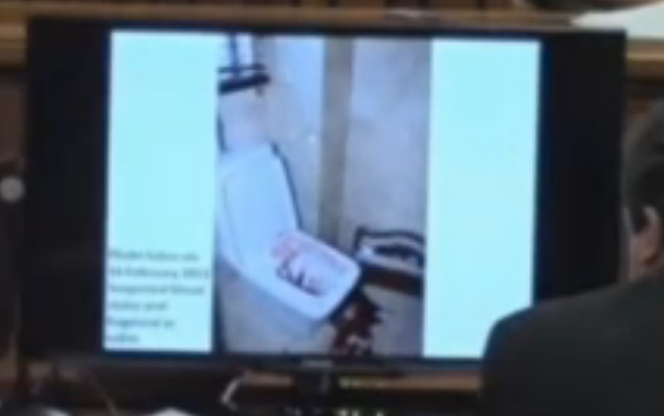 The gun on the shower mat, a cell phone (with the cover knocked off of it) and more blood spatter can be seen. 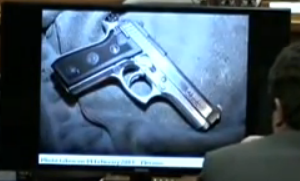 A close up of the gun. It was found cocked and ready to fire. 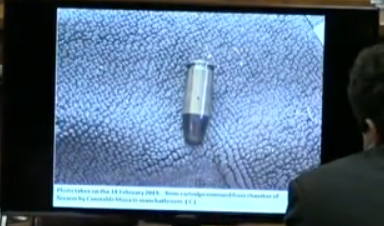 A bullet that was removed from the gun. 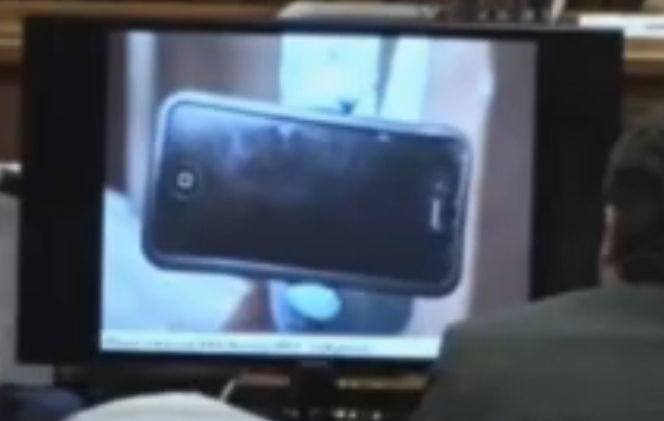 The black cell phone (Reeva’s) that was found peeking out from underneath the shower mat. 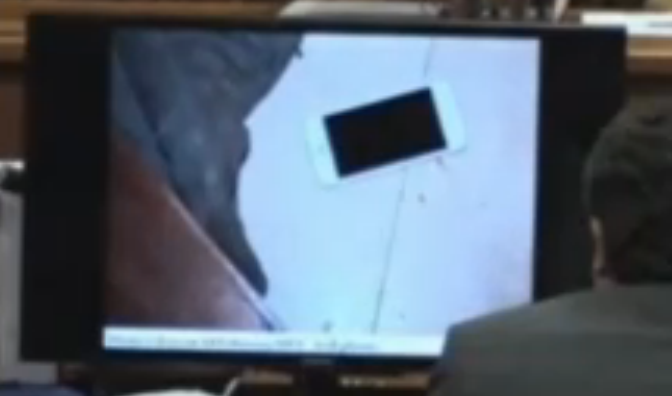 The cell phone case that was found knocked off of the phone underneath the shower mat. An additional white cell phone (later determined to be Oscar’s, phone number 4949) was found in the bathroom underneath the bloody towels. Van Staden found the phone and photographed it. 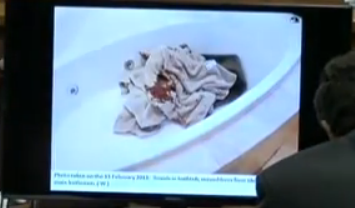 He then put the bloody towels in the tub and photographed them again while he continued his investigation. Damaged metal plate on the front of the bath tub. The windows on the left side of the bathroom. Oscar claims that hearing a noise in the bathroom and seeing this open window was the reason for his sudden terror and belief that an intruder was in the toilet room. Van Rensburg investigated this window and there was no sign of break in, nor were there ladders down below that would have been needed for somebody to gain entry. If Oscar had simply looked out that window, he would have realized that. This is a view of the bathroom window from the outside. Notice there is no ladder in this photo. In the bathroom, looking toward the toilet room. 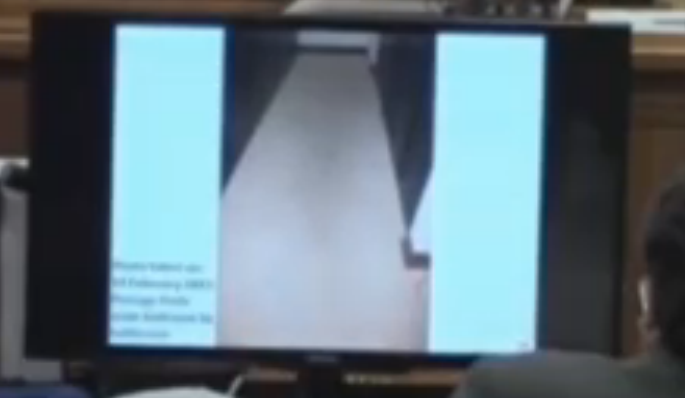 To the left of the door on the ground are some white items. One of those items is a bathroom scale. But harder to see are a bunch of broken bath tiles. Several tiles where broken off of the wall and lay on the ground. 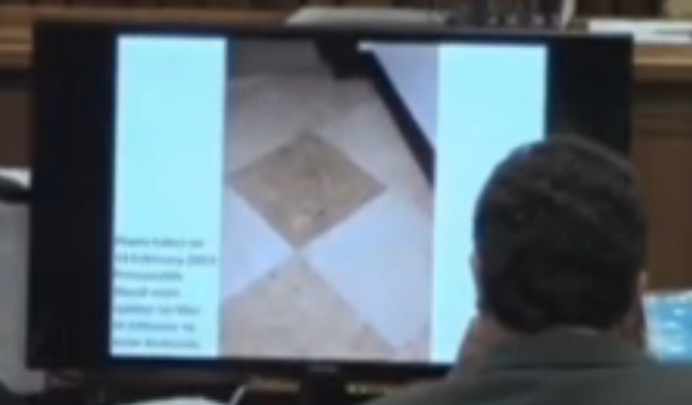 It has not been discussed in testimony yet as to how they believe those tiles were broken. The toilet room door with the panel broken out. Only a small portion of the wood panel remains on the left side. The front of the toilet room door (facing bathroom). There is a key with a green keychain inside of that lock. Looking inside the toilet room. The toilet is to the left and wall to the right. 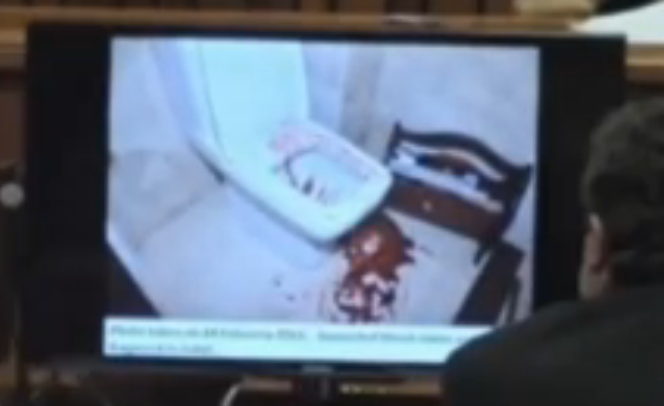 Broken pieces of the door and blood spatter can be seen on the floor, on the wall, on the toilet and in the toilet. There was also damage done to the wall from the bullet fragments but it cannot be seen in these photos. 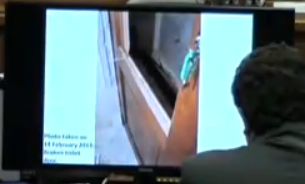 NOTE: the long thin panel of wood seen inside the toilet room appears to be placed there (by Oscar, not police, as the police found it this way) after he dragged Reeva out. 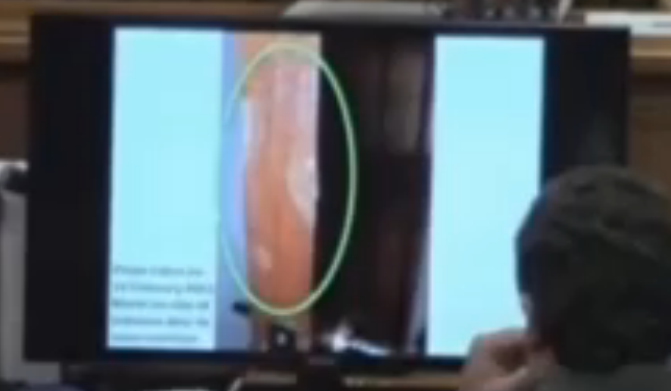 You can see blood smears underneath the panel, but in addition… Van Rensburg testified that there was human tissue (possibly from the head) that was found on the underside of that panel. 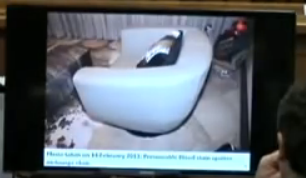 Why was that panel moved in to that toilet room after Reeva was taken out? 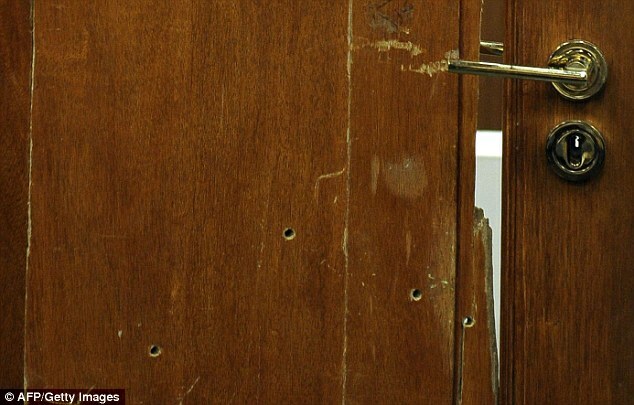 And again… here is a photo of the toilet room door reassembled in the courtroom that shows the 4 bullet holes and damage done by the cricket bat. Oscar was kept outside in the garage, being guarded by police. 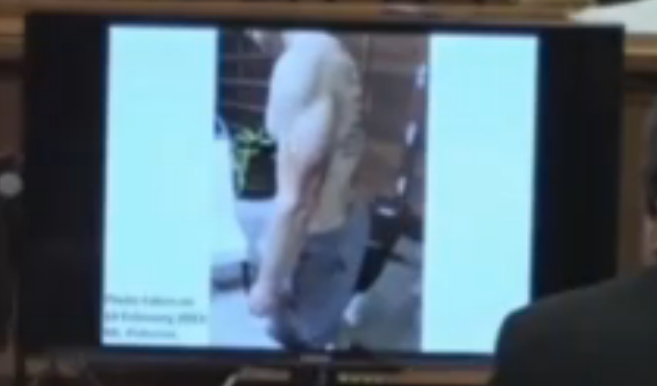 A few photographs were taken in the garage that show large blood stains on the right side of his shorts and body. In this photo it initially appears as if he does not have prosthetics on but if you look closer he does. His left side was photographed as well. Oddly, he seems to be missing blood on his chest and shoulders. It almost looks like he was wearing a shirt and then took it off. 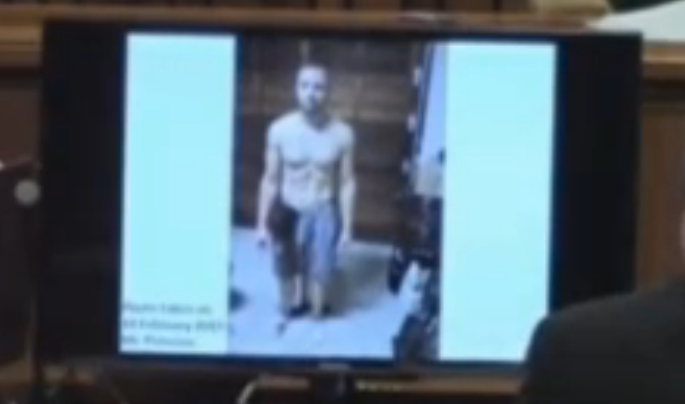 Van Rensburg testified that Oscar was found shirtless and in shorts when he arrived on the scene. The amount of blood on the front of his body and the back appears to be about the same. 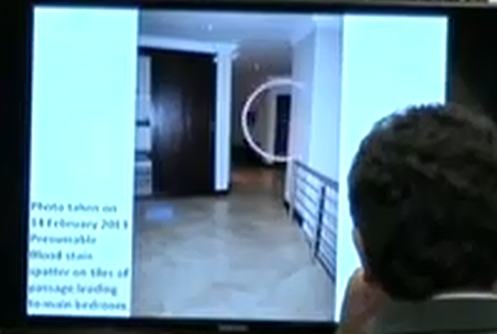 After Van Rensburg was done inspecting the upstairs, he came back down to the kitchen and asked Oscar if they were alone inside the house (meaning, were he and Reeva alone that night). Oscar responded, yes. Van Rensburg let him know that he viewed him as a suspect and informed him of his rights, however he was not arresting him at that stage. He says he did this because there was still some information that needed to be followed up on first before he could make the arrest. He did request Oscar to remain present at all times at the scene and they moved him to the garage. Carl (his brother) must have already arrived by this stage because Van Rensburg testifies that he was unsure if Oscar or his brother called the lawyer (Oldwage). At some point very shortly after that, Oldwage arrived. The people who STILL HAD ACCESS TO OSCAR at this stage were: Mr. Stander, Ms. Stander, Carl and his lawyer Oldwage. Van Staden was the official photographer of the scene. 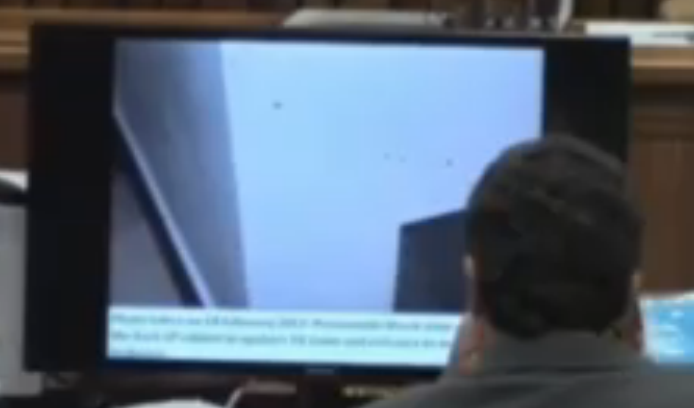 Van Rensburg and Hilton Botha had already completed their observation of the upstairs when Van Staden arrived. Oscar was now in the garage. They first showed the deceased to Van Staden and he took photos. Hilton and Van Rensburg turned her over and Van Staden took more photos of her injuries. The three of them (Van Rensburg, Botha, Van Staden) then went upstairs together. 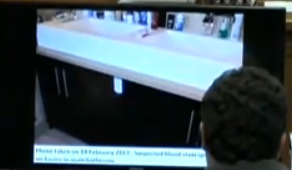 They pointed out elements of the scene that they wanted Van Staden to focus on, and gave him the order to take photos. 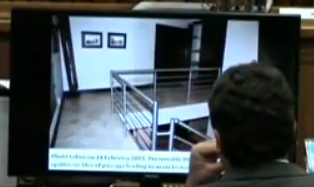 The two of them went back downstairs while Van Staden photographed alone. 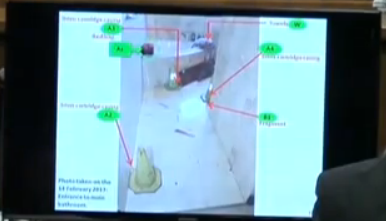 Van Rensburg says he and Hilton did go back upstairs one additional time while Van Staden was up there to make sure they had all the evidence that needed to be gathered. 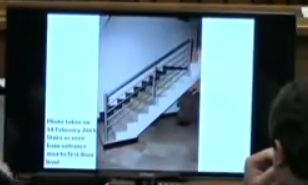 During the time that Van Staden was photographing, no forensic members or family members were present upstairs. 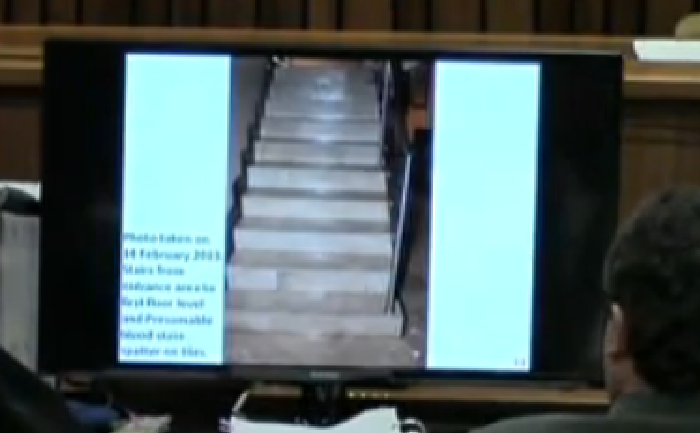 At a later stage, after all photos were taken, Aimee Pistorius requested to go upstairs and fetch clothes. He sent Van Staden to accompany Aimee and see what she took, and where she took it from. He requested that whatever she took be documented or photographed. 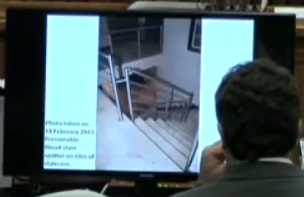 Nel addressed two issues that occurred on the scene during the investigation. First, while Van Rensburg was in the bathroom working on the scene, one of the forensics people (Motha) picked up the gun without his gloves and took the magazine out. Van Rensburg immediately reprimanded him for doing this. Motha put the magazine back in, put the gun down and put his gloves on. He then proceeded to pick up the gun and make it safe. The second issue involved a missing watch. 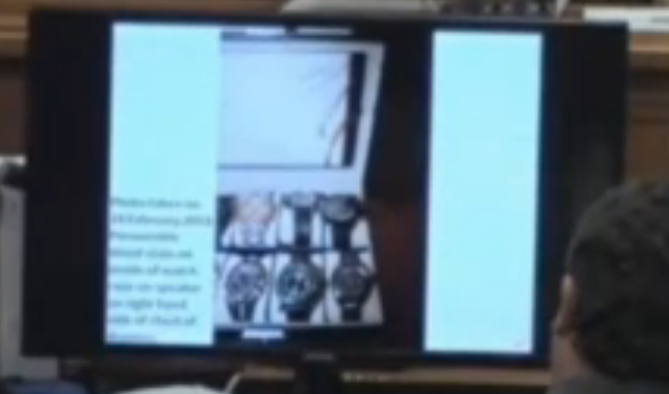 There were 8 watches in the box in Oscar’s bedroom upon arrival at the scene. One watch was taken by Aimee when she came to retrieve clothing for Oscar. But a second watch then went missing after Van Rensburg informed his forensics people to be very cautious about expensive property. As soon as he realized it was missing, he ordered all of his people downstairs in to the garage where they were body searched and their bags were searched. They never found the watch. A report was opened by Van Rensburg to investigate the situation. Oscar had already been arrested and taken to the hospital/police station when this happened so he was not in the house at the time. On the first day of the investigation, there was not a formal inventory of all items removed. 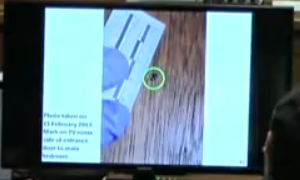 Each individual forensics person keeps their own notes and reports and that is what they use to document the items. 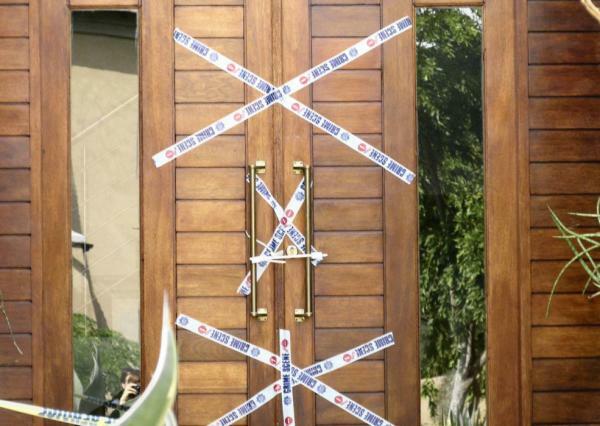 As for how the house was guarded on the morning of February 14: Van Rensburg, and the constable that he arrived with that night, first enacted a security barrier at the scene. When they moved Oscar to the garage, a barrier was put in place that closed off most portions of the house, but allowed some access to the garage (since Oscar was being held there.) At the entrance of the garage door was a police officer, as well as another police officer at the front door to the house. As the morning progressed, they also set up barriers outside. And then eventually had controls set up at the main gate to Silverwoods where everybody had to be cleared before they could drive up to the scene. This helped to keep the media out. 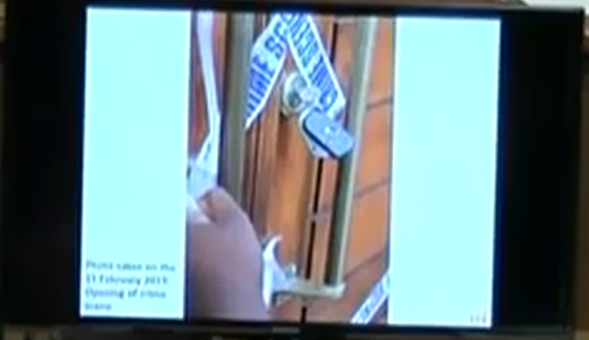 Van Rensburg testified to being furious about the missing watch situation, so as of the next day on the scene, he enforced a stricter rule that everybody had to sign in when entering and then sign out when exiting. All exhibits that were taken out were sealed and documented. 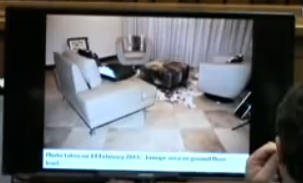 Nobody called Reeva’s family from the scene that night. They were informed of Reeva’s death by the police later that morning. One other note… A locksmith was called to the home so that Oscar and his lawyer could access items from his safe downstairs. It was not mentioned what they took from the safe. It’s concerning to me that up until the time that he was formally arrested on scene, there were a fair amount of friends/family members with access to him. Not to mention that his lawyer was on the scene asap as well. 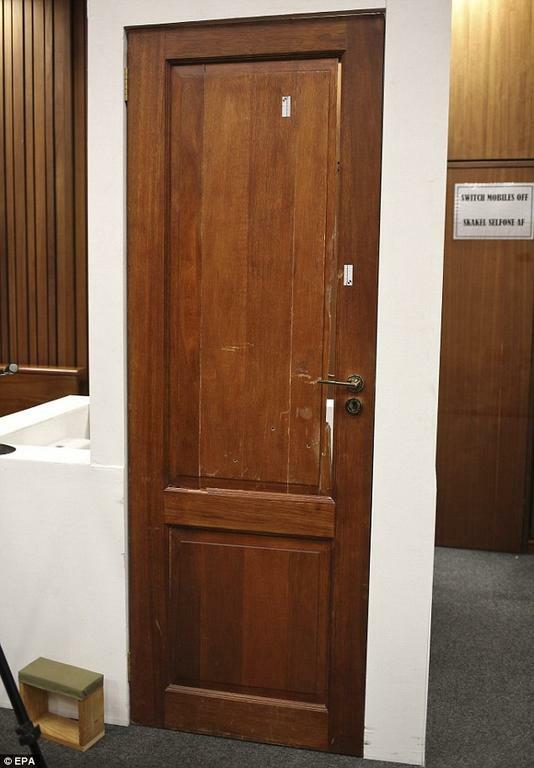 Roux spent his cross-examination questioning Van Rensburg about errors made by the investigators on this case, which is to be expected, as well as accusing the police of moving items at the scene. Van Rensburg does admit there were some errors which they covered in detail on his direct examination but as far as moving items, he was very adamant that the scene was documented as it was originally found. It’s standard defense 101 to bring out police errors and make their work look sloppy. You see that in almost every trial. The difference in this trial is that it’s not a jury who will decide Oscar’s fate, it’s a very experienced Judge who understands what level of error is acceptable and what level is not. She also has probably seen every Defense trick in the book. She can tell which issues are of legitimate concern and which are just a diversion. He did not walk over to the right side of the bedroom at that point. He went to the left and continued to follow the blood trail. 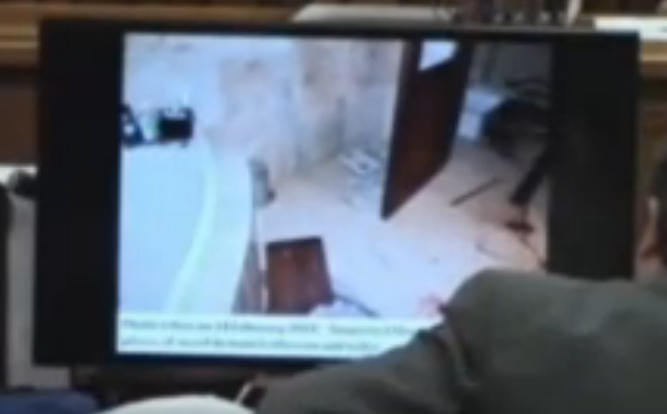 He and Hilton Botha moved in to the bathroom and were there for a while. They did not touch or move anything. They observed what they saw and pointed things out to each other. 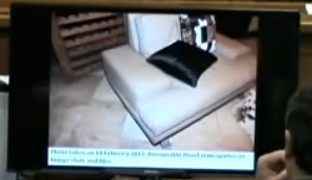 Since Van Rensburg had been told (by Ms. Stander) that Oscar stated he thought Reeva was an intruder, his intention was to determine if there was in fact an intruder who may have gained access to the house. So after leaving the bathroom he went past the bed and out on to the balcony to see if there was anything suspicious. Looking over the left side of the balcony, he noticed ladders stacked flat on the ground. He then went back in to the bedroom. Hilton was still in the bathroom at that time. He next noticed the cables (cords) laying on the right side of the bed. And he also focused again on the sandals on the left side of the bed. That is when he saw the holster on the left side nightstand. He left the bedroom and went to observe the spare bedroom right next door. Hilton was still not with him. He checked the windows which were locked and the door was also locked with a key that was in the keyhole. This is the second door that has been mentioned that was locked with a key in the keyhole. (The first was the door at the top of the stairs that leads to the Jacuzzi) If it is standard practice that some or maybe even most of the doors in this house always have their keys in them, perhaps the keys that were seen on the outside of the toilet room door were always there? He then went in to the second spare bedroom, again on his own. He entered the bedroom and went in to the bathroom area and noticed a toothbrush and toothpaste that had been used. There were signs that somebody had been staying in that room. 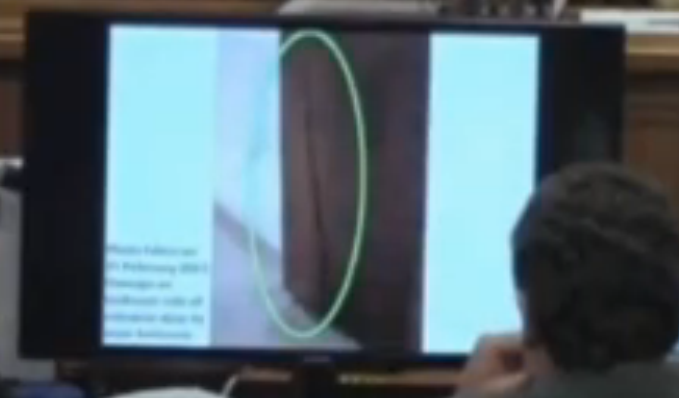 No further details were given during testimony and Roux didn’t ask him anything about this. After he was finished inspecting the upstairs, he went back down to the kitchen where Oscar was. This is when he notified him that he was a suspect. 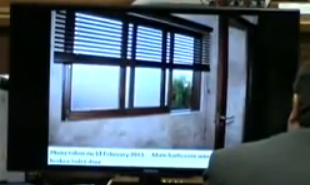 Van Rensburg now moves on to when Van Staden arrived and explains their investigative process to Roux. 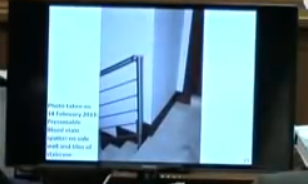 He states that when the three of them went upstairs, he and Hilton were pointing out the blood trail to Van Staden and Van Staden was taking photographs. He photographed everything as it was found first before anything was touched. After the initial scene was documented, they then began to investigate items meaning that they did have to touch and move things. 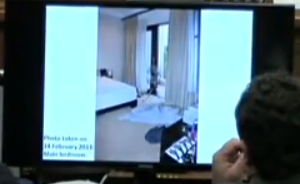 A few of the items he mentioned were the spreading open of the duvet on the floor due to the blood droplets that were found, turning over the panel in the toilet room where human tissue was found on the underside of the panel, and looking under the bloody towels in the bathroom and finding the white phone. Nobody else was allowed upstairs while Van Staden was photographing. When forensics personnel arrived at the house, they had to check in with the guards at the front door. Van Rensburg would instruct them when it was ok for them to come upstairs. The ballistics person that arrived was Motha. 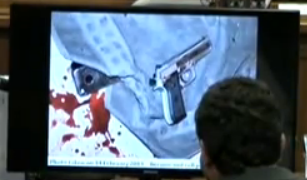 (He was the one who handled the gun without gloves, as mentioned by Van Rensburg on direct). 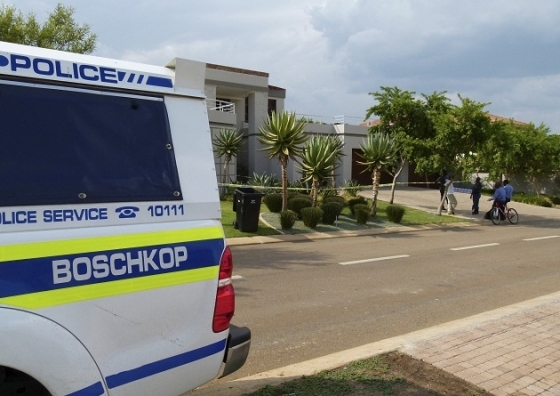 Van Rensburg left the scene around 2:00pm on February 14. They sealed the scene by locking all the windows and the doors, including the main door. They kept the keys at the police station. Since there were two dogs on the property, they had the gardener take out some food for the dogs so they could be fed. 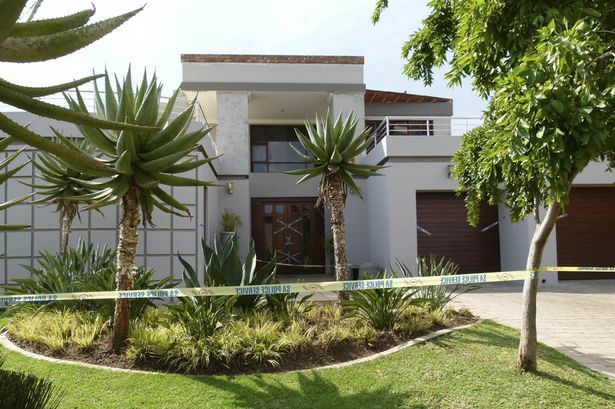 Van Rensburg states “he (the gardener) was staying on the right hand corner (of the house) but he didn’t have access to the house.” They took his keys away to make sure he couldn’t access anything. By looking at the photo of Oscar’s house at the very top of this post, I believe the gardener’s quarters are to the left front (the section that has the square pattern on it). 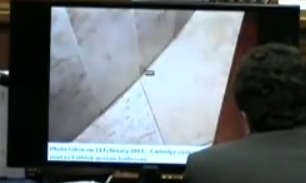 Van Rensburg describes it as being on the right hand corner of the house, but I think he means the right hand corner if you were looking from the inside, not the outside. I could be wrong about this. I have heard it reported that the gardener’s quarters are off of the kitchen, so if that is the case, it would have to be the left side of the house (if you are looking at it from the front street). They then placed a seal at the front door. Photos were taken of the seal. After that time, everybody who entered and exited the home was added to a list. Roux reads through the statements of a few different officers who were on the scene that early morning and some of the officers are claiming to have either arrived first and/or gone upstairs. Roux also challenges Van Rensburg with Hilton Botha’s statement which claims that Oscar was already in the garage when he arrived. He also claimed that Oscar was wearing a bloody shirt. Botha’s statement does not match the timeframe that Van Rensburg is giving in court. According to Van Rensburg, Oscar was still in the kitchen when he and Botha first went upstairs. Van Rensburg strongly denies those statements made by the two police officers, and also does not agree with Botha’s statement of Oscar being in the garage (when Hilton arrived) with a bloody shirt on. He says that Oscar was shirtless the whole time. Van Rensburg again tells the court that he was the first on the scene (along with the constable that came with him). Hilton Botha then arrived and the two of them went upstairs together for the first time. Oscar was still in the kitchen at this time. He also says that each police vehicle has an AVL system. It captures timeframes when police vehicles are moving about. He says the court is more than welcome to have access to that evidence (which can prove that he was there first). 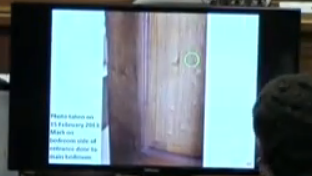 Roux shows Van Rensburg some photos and is continuously insinuating that he and his police team have “disturbed” the evidence but Van Rensburg keeps explaining to him that the house was first documented as it was found and THEN they started investigating. Nothing was moved prior to those first photos. Roux’s arguments here seem like a big smoke screen to me. Obviously investigators have to touch and move things at some point to investigate the scene. It seems to me that they took careful measures to document everything, including the items that they later moved. 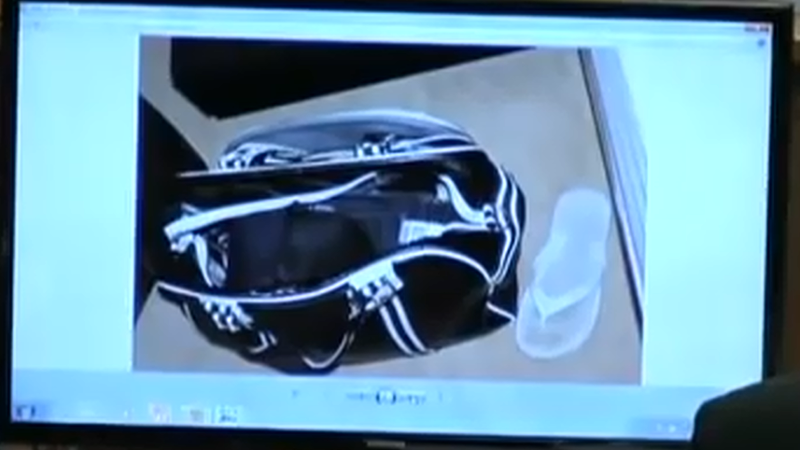 To illustrate how he believes the scene was disturbed, Roux shows some photos of Reeva’s overnight bag and the sandals in various positions, the duvet moved to a different position on the floor and the curtains closed while Van Rensburg was handling some the cords on the ground. Roux tells Van Rensburg that when Oscar brought the fans in that morning, they were operating and on. Roux wants to know who interfered with the fans. Van Rensburg tells him that the silver metallic fan was not on and the other black fan that was in the corner was not plugged in. That is how they were found when they arrived. 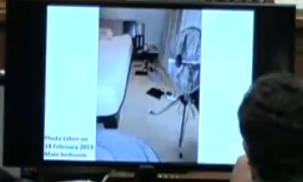 Van Rensburg states that the photo where the room is darkened (and the fan has been moved) was taken later on in their investigation. Again, reiterating that this does not depict the original scene. Nel on reexamination establishes that all photos have meta data which confirm the dates and times of all official photos taken at the scene. 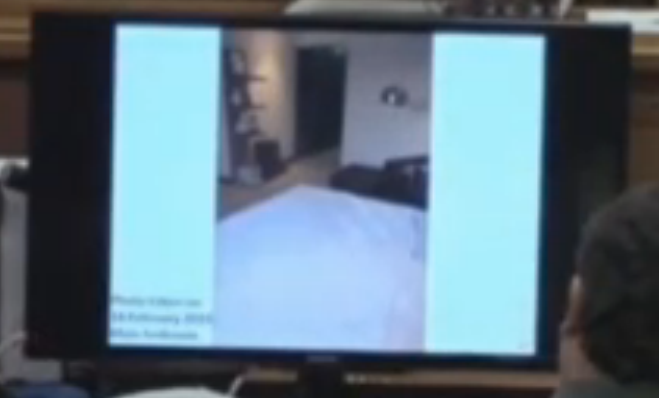 He asks Van Staden to retrieve the meta data for the photograph of the darkened bedroom with curtains closed. It is determined that the date on the photo is not the correct year. This was not from the official photographer’s camera, therefore Nel will not even proceed with it because it’s of no value. It was a trick by the Defense. That photo was clearly not from the original scene, but of the scene taken much later by somebody else’s camera, likely another officer (as these are photos that were provided by the police). Court is adjourned and Van Rensburg is excused. Please include in this excellent review of the evidence as to the location of the other 2 fired cartridges the last 2 were in the bathroom area ..#3. on right side between towel && wall and another one#4 between the criket bat and a towel…all 4 were accounted for. I dont get how the first one got in the passage on the left side if he shot her after turning right, walking down a few feet and turning right again to face the toilet door??? I found a pic in Day 11 that shows the cartridge near the cricket bat… now looking to see if I have a pic of the last cartridge as we speak. 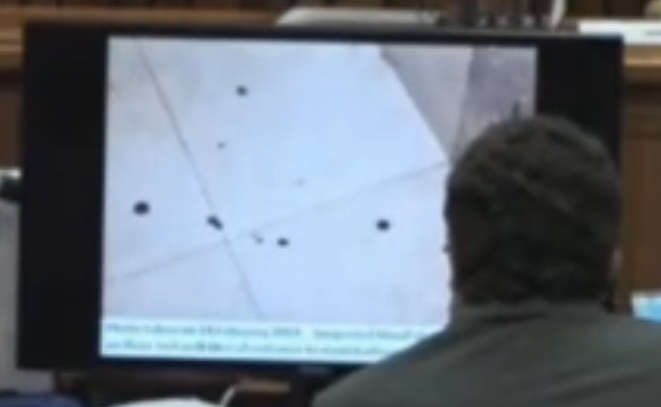 These are the notes I have from Mangena’s testimony regarding the location of the cases: As for the position of the cartridge cases, he was not able to tell exactly where Oscar was standing for each shot because the cartridge cases were so scattered at the scene. Based on the fact that there was a lot of movement in the bathroom after the shooting, they were likely kicked around. I agree that the cartridge in the carpeted passageway from the bedroom is troubling. But in the absence of any additional blood spatter or bullet fragments in that immediate area, they can’t really link it to a gunshot occurring in that vicinity. There are lots of pieces of apparently important evidence that haven’t been brought up in court. 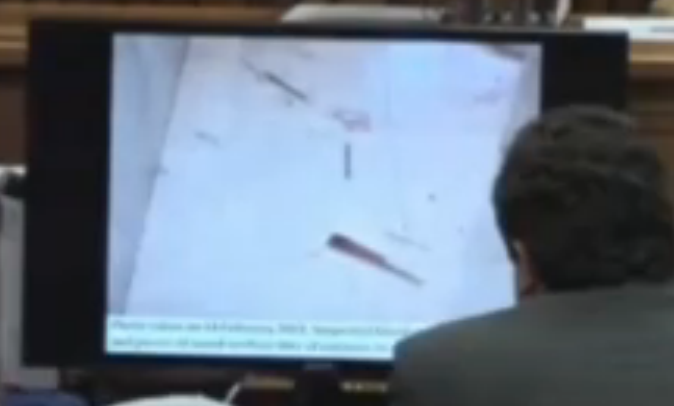 Was the toothbrush in the spare bathroom Reeva’s? 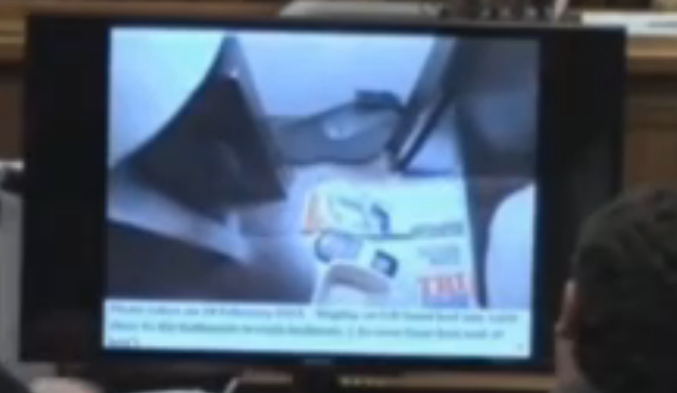 Were the jeans on the floor really Reeva’s or were they Oscar’s. Were the jeans lying outside Reeva’s? I am joining in at a later stage and am not altogether up to speed. Any ideas about how the “hole” got into the bedroom door? 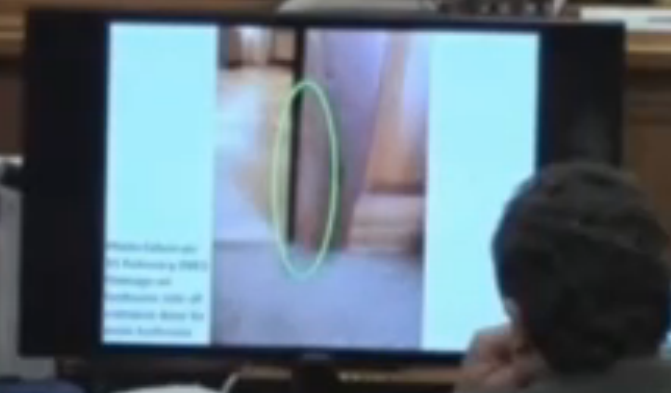 And was the damage to the door discussed in the evidence at any time. I am concerned that there was shooting in other parts of the house, in addition to the bathroom, and that there was a lot of bashing with that cricket bat. 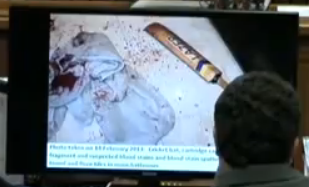 How on earth did the blood get to be on the tip of the cricket bat, and how did the blood spatters get onto the bat? Did the toilet door bleed when he bashed it? Or maybe the bedroom door bled? 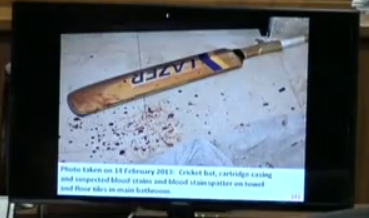 I would almost be certain that it is Reeva’s blood on that cricket bat. How did the fabric on the cricket bat become damaged and unravelled? Perhaps this happened in the fight that occurred before OP bashed Reeva in the head with the same bat. 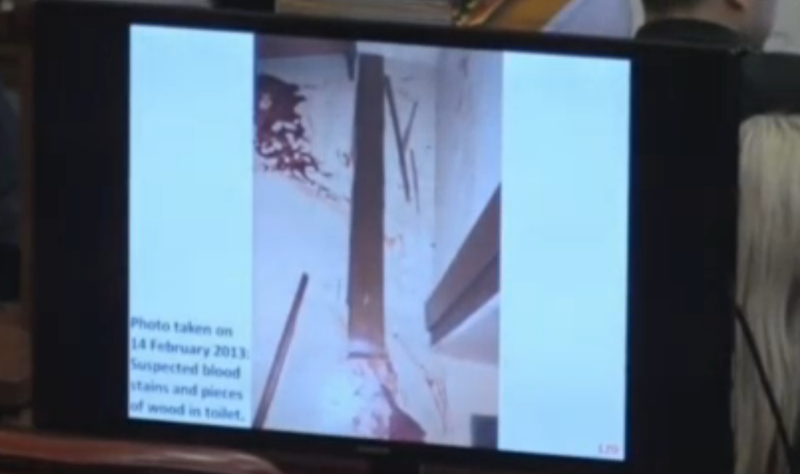 Perhaps Reeva attempted to remove the bat from OP to save her life and the damage occurred in that struggle? Does anyone have any information on the report that OP bashed Reeva in the head with the cricket bat, and that this was told to Reeva’s parents by the Police/Prosecution? This is so sad for the parents, family and loved ones of Reeva Steenkamp, and I would hope that justice will be served for Reeva and her family & loved ones. The bedroom door had a hole through it the same size of a pellet, so no doubt at some point, somebody shot a pellet (from the air gun) through that door. The questions are: who, when and why? In addition to the hole, there is also damage on the edge of the door near the handle area and the bottom near the lock is cracked/kicked in. 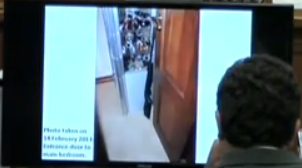 Oscar claims that after the shooting, and after he went downstairs to open the front door, he kicked the bottom of the door to undo the bottom lock/latch. He claims he wanted that door open and instead of just leaning down to unlatch it, he kicked it. Stupid… and a really bad story. He told this story in direct examination and Nel never challenged him on it in cross. So it remains a mystery to us. As for the cricket bat/blood/head injury- it was only early on that they thought he used the bat on her head, which was a good assumption based on the photos. But during the autopsy, the medical examiner was able to confirm that there was no blunt force trauma. Her injuries consisted of the gunshots, splinters and abrasions from the wood on the door and some other smaller bruises. Nothing that would be consistent with the bat hitting her. She had arterial spurting so a lot of the spotty type blood that you see in the bathroom was spurted or dripped by her. Sorry to be graphic. By Oscar picking her up and moving her throughout the house, her arteries spurting and her long hair soaked with blood – there was quite a bit of spatter all over the place. 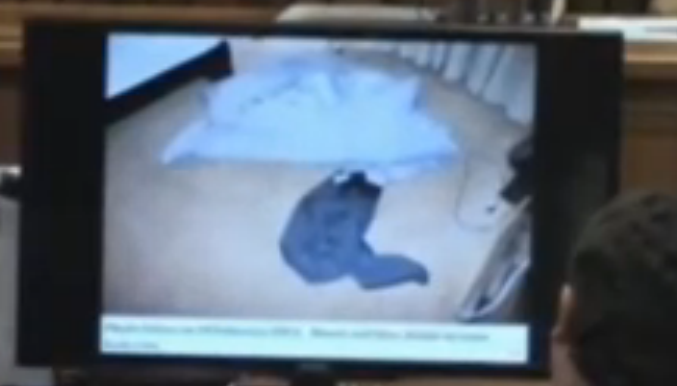 Perhaps that is why Reeva ran to the toilet area rather than out the bedroom door during the ‘argument’ ! The bedroom door was locked and he said the cricket bat was on the floor against the door to assure no one could get in .